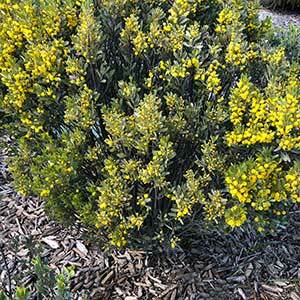 A naturally small growing species, Acacia argyrophylla comes in two forms, the species itself which can reach around 4 metres in height, and a dwarf form which will reach around 1.5 metres. Both are commonly called the Silver Mulga for the silvery green colour of the foliage and both have typical golden yellow flowers. Both varieties are well suited for helping to establish a new garden, they are fast growing and relatively neat in appearance. 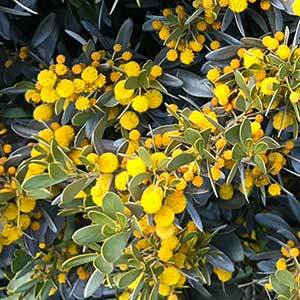 You could also use them as a background plant in a native garden border, or a screening plant. This is plant that requires a well drained soil to grow well. It will grow in full sun or light afternoon shade. Hill up the soil to improve drainage if needed. Water deeply during long dry periods in the first summer, allowing the soil to dry well between watering. Botanical Name – Acacia argyrophylla. Origins – Flinders Rages in South Australia. Foliage – Silvery y green.